So excited to see this new pattern today, just when I was looking for a new project. Just wanted to comment though on Row 3. The first section before the ** ends with 6 DC, which makes sense. Then, at the end of the repeated section it says 7 dc. I’m finding that I need to do 6 dc there because if I do 7, I’m moving into the stitches for the decrease. However, at the end of the row, it is 7. Thanks again for this pattern! I love ripples, but really prefer ones like this that don’t just repeat the same row again and again. The variety keeps me interested. Thanks for pointing out that error. I have now corrected it in the pattern. I’m sorry I haven’t posted anything in so long. I hope to start having more time to post more. Can’t imagine why you haven’t enough time . . .
Of course, I’m kidding. I’ve all the time in the world and do nothing most of the time. Just wanted to say: you’re doing fine – and I’m here whenever. Thank you for all you do and for all you share. You do a GREAT job and you are much appreciated. I would like to tell you how wonderful I think you and your crochet patterns are the best ever – on my top 10-List of favorite crocheters and designers! I love this new blanket and can’t wait to get started on it! Thanks so much for sharing your knowledge with us! Happy Mother’s Day to you!! I’m going to give this a try–I too love ripples and I think this is a unique pattern. Per your: For the rest of the blanket, work all stitches in both loops. Where do you say at the beginning into single loop? 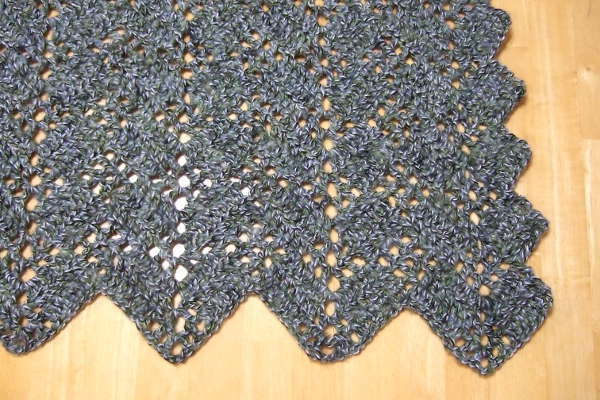 After ch, does this pattern call for going through the back ‘purl’ or only 1/2 of the V st? Row 1 is worked into the chain. Usually only one loop of the chain is used. Then before Row 2 I said for the blanket to be worked in both loops. I’m a little confused. I just finished the 4th row, but how do I increase to get the zigzag edging to work? Help!! For the first three rows the row length was increasing on the ends. For row 4 you slip stitch across several stitches and then leave stitches at the end unworked. This shortens row 4. As you continue the pattern you will see where this creates the ripple look on the edges. We haven’t set up a newsletter yet but I’m glad you enjoy the patterns. For now I have notifications on Facebook, Twitter and Instagram. How would I do this pattern if I wanted straight edges instead of the rippled edges? You will need these special stitches. dc3tog – double crochet 3 stitches together (uses three stitches, decreases by two stitches) – [Yarn over, insert hook in next stitch, yarn over and pull up loop, yarn over, draw through 2 loops] 3 times (4 loops on hook), yarn over, draw through all loops on hook. Begin with one less chain than the pattern. Row 1: Skip first 2 ch (counts as first dc), dc2tog (using the 3rd and 4th ch from hook), dc in each of the next 3 ch, (dc, ch 3, dc) in next ch, dc in next 6 ch * ch 1, skip 1 ch, dc next ch, ch 1, skip 1 ch, dec, ch 1, skip 1 ch, dc next ch, ch 1, skip 1 ch, dc in next 6 ch, (dc, ch 3, dc) in next ch, dc in each of next 6 ch. Repeat from * across to end. On last repeat replace the last 3 dc with a dc3tog. Row 2: Ch 2, turn, skip first dc3tog, dc2tog (using 2nd and 3rd dc), dc in each of next 2 dc, ch 1, (dc, ch 3, dc) in ch-3 sp, ch 1, dc in next 7 dc * ch 1, skip 1 ch, dec, ch 1, skip 1 ch, dc in each of next 7 dc, ch 1, (dc, ch 3, dc) in ch-3 sp, ch 1, dc in next 7 dc. Repeat from * across to end. On last repeat replace the last 5 dc with dc3tog using last 3 stitches. Row 3: Ch 2, turn, skip first dc3tog, dc2tog (using 2nd and 3rd dc), ch 1, skip ch-1, dc in next dc, ch 1, (dc, ch 3, dc) in ch-3 sp, ch 1, dc in dc, ch 1, skip ch-1, dc in next 6 dc * dec, dc in each of next 6 dc, ch 1, sk ch-1, dc in dc, ch 1, (dc, ch 3, dc) in ch-3 sp, ch 1, dc in next dc, ch 1, skip ch-1, dc in next 6 dc. Repeat from * across to end. On last repeat replace last 6 dc with dc3tog using last 3 stitches. Row 4: Ch 2, turn, skip first dc3tog, dc2tog dc (using ch-1 sp and dc), dc in ch-1 sp, dc in dc, (2 dc, ch 3, 2 dc) in ch-3 space, dc in dc, dc in ch-1 sp, dc in dc, dc in ch-1 sp, dc in dc * skip dc, ch 1, dc in next dc, skip dc, ch 1, dec, skip dc, ch 1, dc in next dc, skip dc, ch 1, dc in next dc dc in ch-1 sp, dc in dc, dc in ch-1 sp, dc in dc, (2 dc, ch 3, 2 dc) in ch-3 space, dc in dc, dc in ch-1 sp, dc in dc, dc in ch-1 sp, dc in dc. Repeat from * across to end. On last repeat replace last “dc in dc, dc in ch-1 sp, dc in dc” with dc3tog (using dc, ch-1 sp and dc).